Left Hand Traffic in the UK. Why Left Hand Traffic, in the UK? We, in the UK, are one of the countries in the world who drive on the left hand side of the road. We're part of a minority of 34%, as depicted on the map in blue. The majority, at 66%, drive on the right, including most of mainland Europe, and are detailed on the map in red. The only European countries who don't drive on the right are the UK; Ireland; Malta and Cyprus. So why do we drive on the left? It's widely accepted to be related to the practicalities, and niceties, of a time when most people travelled on horses or horse-drawn vehicles and the fact that the majority of people are right-handed. The theories below generally cover the main reasons why we drive on the left. It's supposedly easier to mount a horse from the left if you're right-handed. In days passed, this also stopped your weapon from restricting your movement when mounting, as weapons were predominantly worn at the left hand side, and stopped the weapon from injuring the horse. Driving on the left also enabled positive social behaviour, in that it left the right hand free and enabled people to shake hands, etc. with neighbours or acquaintances when they passed each other. The first written Act in the UK to stipulate that traffic must drive on the left hand side of the road was The Highway Act of 1773, and was in reference to traffic crossing London Bridge. This was then passed into law as a general 'rule' in The Highway Act (1835). There is, however, substantial evidence that left hand traffic has been the preferred option since at least Roman times in Britain. Archaeologists have excavated many sites where there are deeply gouged tracks on the left side of roads into towns and cities. The depth of the tracks going into these areas are significantly deeper than the grooves travelling out. This suggests that full, heavily-laden carts, possibly on the way into towns to sell goods at market, travelled on the left, causing deep grooves on entering. The grooves on the right hand side of the road, speculated to denote travel out of the towns, have proved to be shallower. It is thought that this is because the goods must have been sold and the carts, therefore, would have been much lighter, carrying far smaller loads. So, it seems that we've had left hand traffic in the UK for an extremely long time! Why have so many countries adopted right hand traffic? There are a few theories about why many countries changed to driving on the right. All of these theories, more than likely, could have had some part to play in different countries. In the 1700's, the introduction of heavy freight wagons in the Americas is one such theory. With no driver's seat, one of the left-side horses was regularly used to transport the driver. Riding on the horse on the left hand side allowed the driver to use the reins and crop to control the horses. To enable the rider to avoid the wheels of other passing freight wagons, left hand traffic was abandoned in favour of driving on the right hand side of the road, reducing the risk to the driver. There is also a theory that in late 18th century France the nobility travelled on the left hand side of the road and forced the peasantry to use the right hand side. After the French revolution, the previous nobility, trying not to upset the new social order, began to ride and drive on the right. The rest of Europe followed suit later as Napoleon grew in power and influence. 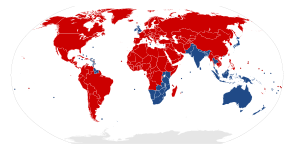 Over time, left hand traffic countries whose borders meet larger countries who drive on the right, have adopted the same 'rule' and converted to right hand traffic to make travel and trade between their countries easier. It was also thought to be a positive strategy by some countries as it reduced the risk of accidents on border crossings. This adoption of right hand traffic has occurred since the late 18th century, right into the 2oth century. The UK, as an island, has never changed, and many (but not all) British provinces have continued to 'drive left'. Abandoning left hand traffic in the UK, and adopting driving on the right, has been considered as an option in parliament on a number of occasions, but was ultimately discarded as too costly. The first rule of the road. Whichever side is adopted, by whichever country, organised traffic flow is fundamentally dependent on whether left hand traffic is legislated, or it's right hand traffic that's stipulated. Whichever side, that's what dictates how the rest of the 'rules of the road' are structured and organised. e.g. on roundabouts in countries where the rule is to drive on the left, traffic travels clockwise around the roundabout, whereas, in countries where it's stipulated to drive on the right, traffic travels in an anti-clockwise direction around the roundabout. Therefore, all other 'rules of the road' stem from which side of the road directs the flow of traffic. This makes it the '1st rule of the road' and the most important rule of the road. We hope this page has been interesting. Our pages on road safety and the Highway Code have even more info, and they're interesting too! !